Let's talk about the different types of orchids. When getting interested in orchids one of the first things people want to know is what are the types of orchids? Orchids are a very large and diverse family of plants. Orchids or Orchidaceae (the same name as our newsletter!) are in the family of monocot flowering plants in the super order Liliiforae. What? Who cares? Some people do! Many people are surprised to find that orchids grow in all the continents except Antarctica. They can be found from the Arctic to the Equator and south from there. The family of Orchids contains more species than any other family of plants; some estimates are now close to 35,000 genera. Yet, interestingly enough there are essentially two types of orchids or types of growth patterns, monopodial and sympodial. Most orchids fall into one or the other category and none of them appear to be a mix of the two. While orchids are readily hybridized between many different genera of orchids, apparently they are no crosses that “cross” this line of this type of orchid. What you say? Let me clarify. Essentially there are two different types of orchids and they are called monopodial and sympodial. What again? And why does it matter? 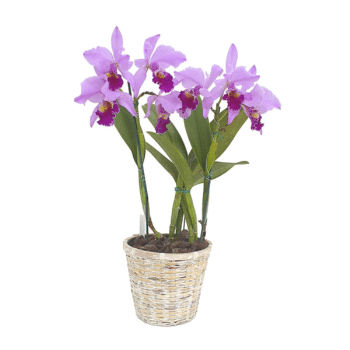 Well knowing whether the orchid you have is monopodial or sympodial is important because this information will help you know how to grow it properly re-bloom it successfully and also gives you clues as to how to propagate the plant. A plant with a single stem that grows continually in one direction from the terminal shoot, year after year, adding a couple of leaves each season; it has neither rhizome nor pseudobulbs. Monopodial orchids grow mainly upward. Essentially these are orchids that have a single stem and the stems grow indefinitely. With this kind of orchid the leaves always grow from the ends of its tip and it flowers from buds at the juncture of the recently matured leaves and the stem. Monopodial is Latin for “single foot”. Examples of this type of growth habit are Phalaenopsis, link to the Phal page, Vanda and the Japanese wind orchid Neofinetia falcata. 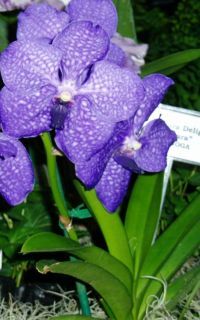 Below is a picture of a lovely "Blue" Vanda. Vandas are classical examples of monopodial orchids. A plant that sends out a new shoot from the rhizome of the previous growth that is a complete plant in itself; a number of lateral branches emerge from just behind the apex of the main stem, which ceases to grow; the bases of the branches are frequently developed as pseudobulbs; when the branches reach a certain length, they stop growing; what looks like a simple stem is made up of the bases of several stems that arise successively as branches, one from another. A sympodial orchid grows out along the surface of the growing medium and the stem can often be horizontal. This stem is essentially a rhizome and the new growths come from buds along the stem and can send out their own roots. Flowers of this group can originate from the base of the plant or from a recently matured pseudobulb or from between the leaves at the top. Sympodial is Latin for “many footed”. An example of this kind of orchid would be Cattleya or an Oncidium. Within these two groups there are additional classifications depending on their manner of growth whether they are terrestrial, epiphytic , climbing or lithophytic. Terrestrial Orchids as their name would suggest grow and flower on the ground. Among the terrestrial orchids are Spathoglottis, Cymbidiums, the slipper orchids and the Chinese ground orchids. However many do not grow in the same soil that we might think of as potting soil. They grow more in the humus and leaf litter that would comprise the “soil” of the forest floor. Epiphyte: from Greek "epi", meaning “upon” and phyton, “a plant”: A plant that grows above the ground on another plant, such as a tree, but is not parasitic on it; derives moisture and nourishment for the air and rain; also call an air plant. Epiphytic orchids are found naturally in the canopy of trees. These are the main group of tropical orchids. They use the trees for support and exposure to sunlight, but do not take any nourishment for the trees on which they grow. They are not parasitic. They produce aerial roots which do not thrive in soil. Many Vandas are epiphytic. Climbing orchids are monopodial. They often originate on the ground and move up higher in the tree, climbing as they grow. They often have extensive aerial roost. A Vanda would be this kind of plant as well. Lithophyte: Again from Greek “litho” meaning stone and phyte “a plant”. So a plant that grows on the surface of rocks or on stony ground. These types of orchids are rarer and not as commonly cultivated. The lithophitic orchids are manly from the more tropical areas of the world. They grow exposed on rocks and high outcroppings. Their strong roots absorb moisture and nutrients from the air and any additional nutrients from the detritus and organic debris that collect in the crevices of the rocks. The leaves of some of these orchids are often quite fleshy and they have succulent pseudobulbs to help hold moisture to help the plant through any prolonged dry spells. Examples of this kind of orchids is several Pathiopediliums and Bulbophyllum membranaceum that might occur. So this covers the basic types of orchids. If you are interested in particular orchids follow the links to the pages that are on the culture of that orchid.